If you choose the email option. 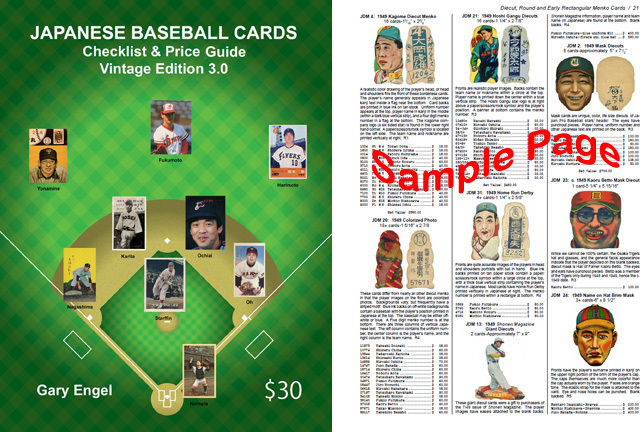 Everything you want to know about Japanese baseball cards from 1929 through 1990. Nearly every set has been given a scarcity factor. That way you will know how rare or common your cards are. These factors range from NS (not scarce) to R5 (five or fewer examples of each card in the set are known.). Approximately 750 different sets are cataloged, with each card in each set individually listed by player name (first and last). Example photos (front and back) are shown for each set. Prices, listed for each card in every set, are based on actual sale and auction prices in the U.S. and Japan immediately prior to publication. Cards Checklisted include menko, bromides, candy and gum cards, karuta, game cards, Yamakatsu, Takara, Calbee, etc., etc.